The Internet contains the most useful set of data ever assembled, most of which is publicly accessible for free. However, this data is not easily usable. It is embedded within the structure and style of websites and needs to be carefully extracted. Web scraping is becoming increasingly useful as a means to gather and make sense of the wealth of information available online. 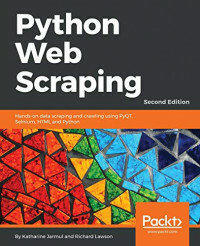 This book is the ultimate guide to using the latest features of Python 3.x to scrape data from websites. In the early chapters, you'll see how to extract data from static web pages. You'll learn to use caching with databases and files to save time and manage the load on servers. After covering the basics, you'll get hands-on practice building a more sophisticated crawler using browsers, crawlers, and concurrent scrapers. By the end of the book, you will have explored testing websites with scrapers, remote scraping, best practices, working with images, and many other relevant topics.